The Economy Portering chair range offers exceptional value for money. Cheap to buy, easy to maintain and extremely robust, the chair will give years of trouble free service. 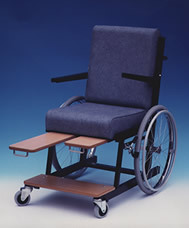 The chair is mounted on 100mm wheels on the front and 610mm wheels with hand rim and brakes on the rear.